Moonlight over Pladda and Ailsa Craig. I awoke at 3am to the the sound of lapping as High Water approached. It seemed very close to the tents and I was concerned about the kayaks. There are two groups of sea kayakers. The first carry their kayaks right up to the tents each night and the second (into which we fall) just carry them up above where they expect the night high tide to come. Fortunately noise carries a long way in a still night and the kayaks were well above the tide. I was glad to have awoken. 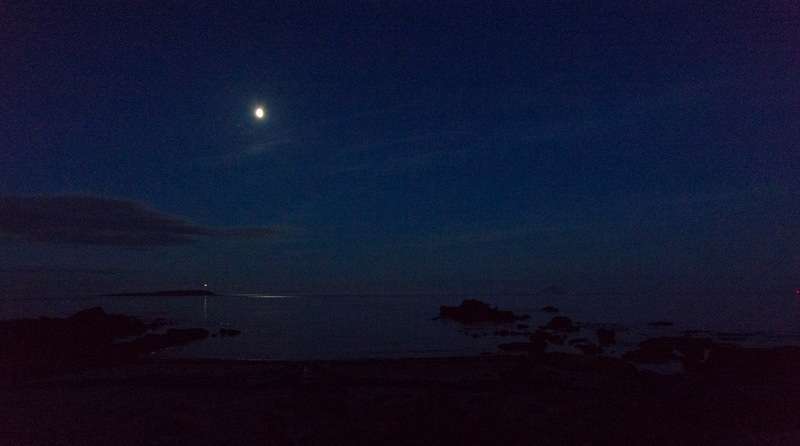 It was just 4 days after a full moon and there was enough light to see both Pladda and Ailsa Craig. Both the moonlight and the Pladda lighthouse lantern were reflecting on the Pladda Sound as it was calm at slack water. I could just see the lights of a fishing boat off Ailsa Craig and to the right of that (at the edge of the photo) I could see the port navigation light of the Dutch container ship MV Energiser making her way up the Clyde to Greenock. Satisfied by the beauty of the scene and reassured by the lack of wind, I made my way back to bed. It would be a long paddle to Ailsa Craig in the morning.